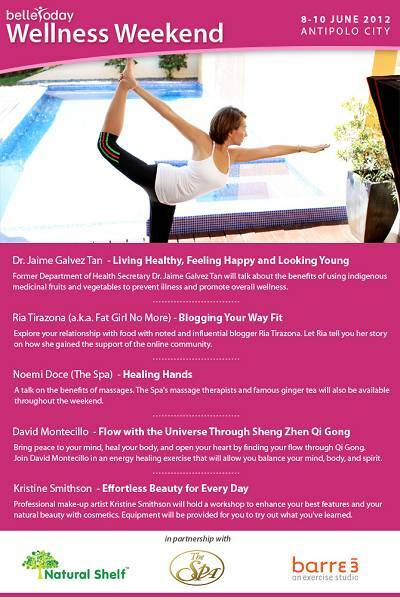 LAST CALL FOR RESERVATIONS at the BelleToday Wellness Weekend! Hi all! Welcome to the Chrono-Geno-Nutrition Diet. 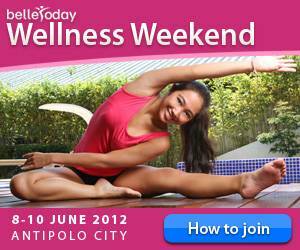 We've all just got started, but we at the BelleToday Team would like to invite you to a fun weekend we have set up on June 8-10, 2012 in Antipolo. John Jay Cuay, who has trained the likes of Venus Raj and Shamcey Supsup, will be teaching Zumba at the BelleToday Wellness Weekend! Just about a week to go! There's still time to reserve your slot! I'm so excited for the weekend! Who else wants in? Start reserving your slots to the weekend so we can make the arrangements for your 1) lodging and 2) transportation. Cannot wait to see you all there! Hi Taryn! It'll be at the First Pacific Leadership Academy (formerly the Meralco Development Center) in Antipolo—it's PhP 4,000 for 3D/2N, including lodging and all food for the weekend. We'll have talks on blogging for weight loss, the benefits of massage, and more. We'll also have healthy cooking demos and various daily morning exercises that you can choose. We'll even have a night of dancing and karaoke. You can also schedule a massage or sneak in a swim during the weekend. Hi can you give more details? is it a stay-in camp? 3-days long? are there fees? how many apticipants are you expecting?